I seriously couldn't have visited on a better day; one filled with sunshine and double-digit weather. Hey, I'm grateful for small mercies when it comes to Britain's weather! Although the building of Basildon Park begun in 1772, my exploration of its interior would have to wait a little longer, as first a certain chocolate brownie called my name from the National Trust property's café. The photo above shows just one of the café's illustrated walls; tranquil and tropical scenes each combining nature and wildlife. There's a special place in my heart for colourful murals and never more so than those suggesting a warm climate. Mmm. 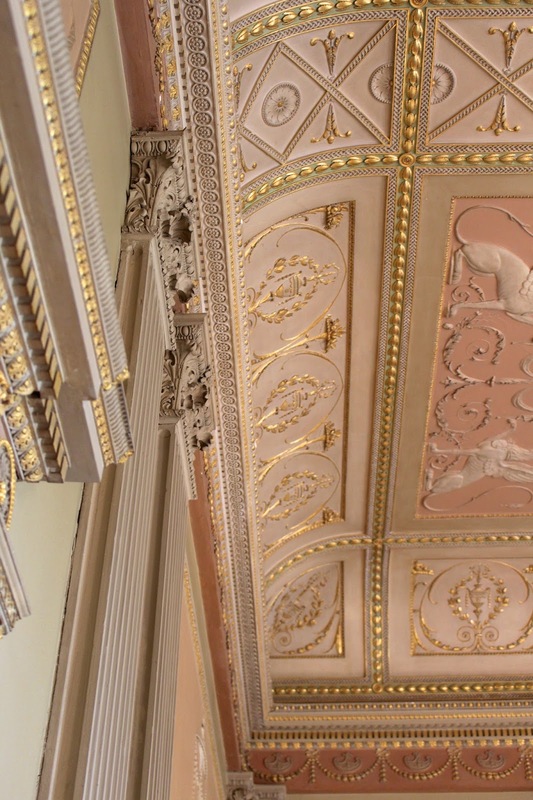 Basildon Park is now a 're-creation and restoration' of the 18th-century mansion, having been rescued in the mid 1950s by Lord and Lady Iliffe. Architectural fixtures and fittings were tracked down, along with fine paintings, fabrics and furniture. The result is spectacular, with each room exuding an elegance that resonates with its bygone era, in a way that feels as though the original occupants have only just left. In particular - like most historic houses - the high ornate ceilings had me swooning, with each room encouraging my camera to turn upwards. Check out the entrance hall's lavish ceiling below! Helpful volunteer guides await visitors, eager to provide a background on each of the downstairs rooms - it's incredible how much information I came away with! A huge bonus for me was undoubtedly finding out photography was permitted throughout Basildon Park. Needless to say, some areas/portraits were off-bounds, however the majority was ready and waiting to be captured. After spending a little while exploring the Bath-stone building's interior, daffodils marked the path to a beautiful walled garden space with scattered benches. I feel like a broken record on A Glass Of Ice by continuously mentioning my adoration for sunshine, but an idyllic moment at Basildon Park seriously encouraged that habit. As the sun beamed down on my suede jacket and forced me to remove my scarf, I looked up and saw the historic house in an even brighter light. Literally. Basildon Park seen as the sun is setting is very, very special! Gloves on, gloves off! The warmer weather makes visiting places such as Basildon Park all the more special. It's impossible not to catch yourself occasionally imagining those from a previous era wandering through the house and grounds. Were they impressed? Did they appreciate just what they'd created? Had they contemplated visitors admiring the location centuries later? 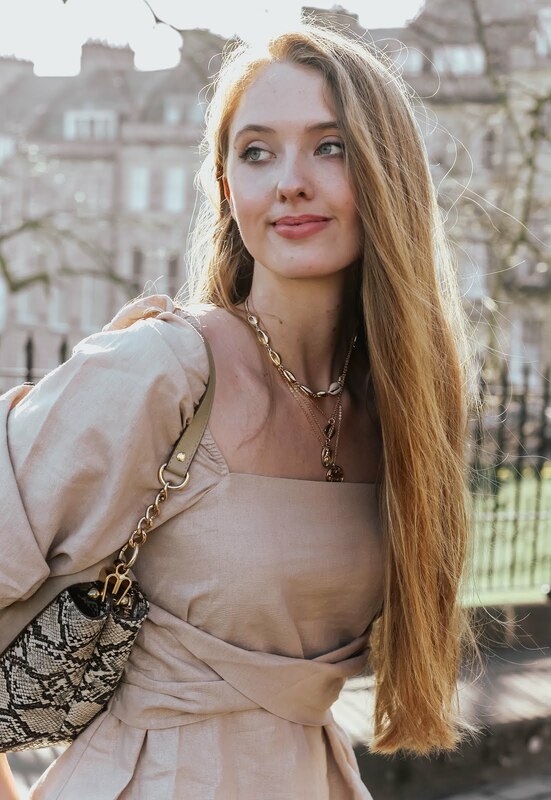 I wish I could hurl samples of the café's brownies in your direction, or perhaps a gorgeous gilded picture frame or two, but I'm afraid this virtual tour will have to do! Though, fingers crossed I've persuaded you to check out this historic venue - and follow in the footsteps of many of those gone before! What a lovely place to visit and that brownie looked so tasty! Beautiful photos! Love to visit this place! How ridiculously gorgeous and picturesque! This looks like such a dreamy place to be, wow. Thanks for sharing Gabrielle! My goodness. This places is so lovely. Like every angle has its own beauty. Omg! I am in love! this place looks amazing! I have such a soft spot for bath stone architecture and this mansion looks incredible! Those ceilings are insanely pretty :) And the complimentary dog biscuits are such a cute idea. I don't blame you for talking about how much you love sunshine- it's such a rarity in England! Looking cute and fabulous doll :) Happy Wednesday! p/s We are taking on the '5 Piece French Wardrobe Challenge'. Insane idea to begin with but do stop by our latest post and let us know what you think! This mansion looks amazing and love those daffodils, so pretty! Thanks for sharing your experience! Basildon Park looks absolutely gorgeous! And I love that they give away free dog biscuits! Complimentary dog biscuits...sold!!! What an absolute corker of a location. Not too far away from me so I'm adding that to my list of places to visit, love a good cultured day out. And I seeeeeeriously wish you COULD throw some of that brownie in my direction...!!! I'm starving right now!! SO beautiful! I always enjoy reading your posts, hun! Wow that looks like such a beautiful and peaceful place. If it looks that nice in photos, I can only imagine how it would be like in person. Oh this place is stunning!! I totally agree, sometimes the place grows on u! Love the architecture and the interiors! And u Gabrielle are beautiful!! Hi Christie, unfortunately I bought these at an independent boutique and so don't have a brand name for them, sorry! That second photo really took my breath away! It was kind of an eerie moment, one can hardly believe that such a magical place is real. Thank you so much for sharing...and how cool is that wall painting (the one with elephants)!!! you look gorgeous as usual! Very stylish casual combo...phenomenal boots! Wow great photos! That seems like a place I would totally like to visit! Thank you for sharing! Thanks for sharing this Gabrielle. Your travel posts are some of the best on your blog, Gabrielle. Not only we're treated with fabulous pictures but your writing takes us through the places with you. ps: How gorgeous is your gloves? They are some of the prettiest I've seen. Wow that place looks beautiful, it kind of reminds me of the Downton Abbey house in some lights? That brownie looks really good as well, I would've gone for that if I was there as well. Priorities! This place looks really amazing! And don't worry about repeating yourself about the sunshine, I think it's gorgeous too and should be more appreciated by everybody else. I would definately want to visit that amazing place. Too beautiful and you look great! That place is so lovely! The interiors are so glamorous, exquisite shots, and I would love a brownie sample please! It certainly looks as if you couldn't have picked a better day to visit Gabrielle! Both the mansion itself and the grounds look spectacular. They did an amazing job restoring the place. thank you for your comment...in refrence to that, I just had to stop by to tell you I think you would look fantastic in flares! Basildon Park looks utterly beautiful like something from a movie set. I can imagine 1920's film being shot here *thinks of gastby dresses*. These photographs are stunning and I love the architectural fixtures and interior decor inside. This place really does have the wow factor. Those grounds are so picture perfect too! Oh wow, this place is absolutely beautiful! I am in awe of the amazing architecture! Wow I wish I could visit Basildon Park; I feel like you always go to these gorgeous, historical sights and they're so fascinating. I don't often see daffodils either, so a field of them looks so pretty. Love your outfit too, the gloves are especially cute! It is such a pretty place, and it reminds me of the Downton Abbey location a bit. The mural is gorgeous, I can see why you love it. I'm and art lover and murals make me happy! How stunning is this place! It's such a wonderful mix of classy, outdoorsy, and peaceful. Wow, incredible photos! What a lovely place! I love the picture of the door that opens up to the green field. Frame that! I definitely see what you mean about it becoming more impressive. Wow, those pictures are stunning. And the complimentary dog treats are so cute! Love it haha. Wow every corner of this place this stunning! I love yours gloves too! Oh my! This place looks amazing! It's like straight out from a movie! So dreamy! btw you're super stunning! I use the word dreamy a bit too much, but I honestly can not think of a better word to describe this trip and location! Wow such a beautiful place and your outfit is on point. This mansion is so beautiful, I love old decorated ceilings they just make me stare in awe! Also that view, what an amazing sight! Definitely a place I'd love to visit in the future! What a splendid restoration, I am utterly captured by the intricate ceiling as well as the dining interiors. Such beauty at Basildon Park. Thanks so much for virtually taking us there with you. Happy Friday! awwww I saw those complimentary dog treats in few countryside locations!! :)) Gorge look as usual - I don't look that smart when travelling! What a stunning location and photographs.. You look great as always! What a beautiful place! I love the decor of that room with the gilded mirrors and frame. I could just see myself laying on that feather filled settee/sofa reading a book. These photos are gorgeous! Gabrielle, I'm a huge fan of 18th century Georgian, so I like this house much more than Highclere. Glad I discovered your blog today, I know I'm going to enjoy it!